We love feedback and we love our students. Here is a slice of life from students past and present. Feel free to contact us to send in your own testimonial. "A fine photographer and genuine contributor to the medium." "I’ve finally returned home and I’m having difficulty adjusting to the normal, boring routine. I’m missing the peace of the mountains. Thank you for a wonderful week of enrichment and immersion into the environment of the Blue Mountains. As a visitor to the area I would never have had the opportunity to visit so many out of the way places without your expert local knowledge. Your gentle approach to all activities allowed me to move at my own pace both physically and photographically. I had a truly wonderful week and know I learnt so much about my photography in all aspects. I believe I have improved some of my skills and hope to continue to use and develop those techniques you have assisted me with. Thanks for the opportunity to use your equipment and experiment with various lenses etc. My week in The Blue Mountains has inspired me to get out more frequently and use my camera at any opportunity. It will be a bit more challenging to find so many interesting places around Perth. Many thanks and kind regards,"
"I wanted to write and thank you so very much for a truly wonderful week. We saw Cradle Mountain in all its weather systems and you made sure we were all able to capture its uniqueness. It is certainly a stunning part of the country and the world and I was so thrilled to finally make it there after years of wishing! You were such a fabulous tour leader and looked after us so so so well!!! I never saw you show any sign of anything other than care and concern. Thank you! It was a wonderful tour and a great group. We certainly experienced some fantastic wildlife and some stunning scenery. The weather was fabulous and to have had the chance to experience the frost and that special fog / mist rising was amazing! I just hope I have a few photos to do it justice. It was lovely to get to know you better and to have the opportunity to have so many great chats. Thank you for being so attentive and supportive and for your guidance and advice both when taking photos and when processing them. I learnt so much. I just need to write a lot of it down so that I don't forget it! I have been able to upload all of my photos which is wonderful. I loved seeing you fly your way around Lightroom and absolutely adored your processed images! WOW!!!!! Just stunning! You must have been thrilled! Looking forward to seeing you next week. Again, thank you for such a brilliant experience! Kind regards,"
“The course this year has been fabulous. When I reflect on what I have learnt, it is very difficult to describe. At one level it is easy. I have learnt many new techniques and I have connected with a much broader photographic community than previously. "Hello Len, First and foremost, I would like to thank you again for a wonderful week in the Blue Mountains. I enjoyed myself immensely, had a great time, learnt heaps, and we had lots of laughs and fun. You definitely have a happy client that will be returning for more. Loved the workshop format and being able to immerse yourself in nothing but landscape photography and everything that goes with it, was just tops. Everyone has different reasons for doing photographic workshops, mine is to learn and to go places that I would not otherwise go to on my own. And we certainly did that! In fact, this is the first 'photographic workshop' that was actually a real workshop and I learnt something as well, that I have done - and I have done quite a few so-called 'workshops'. So please keep the workshop format. You have renewed my vigour, interest and motivation for photography - so thank you for that too. Hope all is well with you. Cheers"
"Many thanks for your help, feedback & thoughts to my photos. Inspiration!!! It's been a wonderful week in your beloved mountains. You've been the perfect Pied Piper - a mine of information, freely given, a knowen of beautiful places, an unobtrusive and supportive teacher, sensitive to everyone's needs, one of life's truly good people. I hope to stay in touch with you and come along for the ride again sometime. With very best wishes, and thanks again." "I would like to thank you very much for your help in getting up steps etc., on the Tassie trip, and for looking after us all. I certainly enjoyed the trip. I went yesterdayand collected the photos I had entered in an exhibition run by a camera club at Gulgong. I received a first in Mono open with a B/W sunset from Stockton Sand Dunes (Port Stephens photo tour) , taken when I was sitting in the vehicle, (the sky came up well in B/W) also a highly commended for one I took of the sunbeams off the balcony at Soldiers Point in Mono. " "Thanks again for a very enjoyable and informative workshop and the individual assistance you gave me during the week and picking me up in Sydney. Much appreciated. I’ve also received nice compliments on the photos you printed for me and on your tree. I’ve said to people that while it was a landscape photography course, I see being in the Blue Mountains, seeing and experiencing it close-up as a bonus from the workshop. I hope this makes sense. Kind Regards,"
"I just wanted to tell you how wonderful the trip to the Flinders Ranges was for me. I can not thank you enough for your patience and tutoring during the trip. Every time I look at those photos I remember how many times you stopped and waited for me to get the photos I wanted and helped me with composition and techniques. I have been doing the aperture exercises you suggested and I am having a lot of fun with it. I look forward to seeing you again sometime in the future, hopefully on another tour. "I spent a wonderful morning with photographer Len Metcalf yesterday. Len was very generous with his time as he shared his knowledge about photographic printing and showed me many examples of the different types of prints and finishes available. Len has a good soul and is a patient and knowledgeable teacher. If you are in or near to Sydney and you are looking for a creative workshop or a one to one teacher then you might like to give Len a call. He is very approachable and has no ego. How refreshing. Thank you Len." “Len’s fantastic ability to make everyone feel comfortable was vital, especially when critiquing other people’s work. The bond between the class members is very strong and supportive. This was even more apparent on our outings. The days were not just for learning and sharing knowledge, but were for having fun. "Hello Len, Well the wonderful break is behind you and now embarking on more adventures to be fully supported by photography. From your newsletter all sounds very exciting and potential for a blossoming future. I just wanted to send you a note wishing you the very best for this afternoon, evening and the same again tomorrow - Master Classes. The year spent with you has been one of the highlights of my life and corrected the photographic dead-end I was on, not realising it but the road was getting narrower and would probably have petered out. Boy have things changed - the full joy and pleasurable challenge has returned; I have made a Learning Contract and 5 weeks into it am going energisedly (if that's a word) strong. So again thank you and warm wishes, and I am pleased for your participants as they are in for a wonderful time. See you in the future." "Just thought I would drop you a line to say how much your course helped me. I’m even trying b & w shots now, and taking more manually rather rely on automatic. I have had a handful of photos published in the Morning Bulletin up (not paid unfortunately) and they even sent their photographer around to get a shot of me as well as publishing a bit of my bio. Next Tuesday a producer from ABC Open is coming to interview me about my photos, of which a number have been published on their web site. Have bought a mat-cutter etc and am going to start selling my wildlife / nature photos, especially the sunrise and sunset photos which people seem to particularly like." "I'm still persuing the learning journey which commenced in Len's Master Class and enjoying the rewards." We started by spending a morning at Len's place, going through the ins and outs of large format and panoramic photography, and then spent the afternoon in the field taking photographs of waterfalls and bush scenes.The next day, it was overcast and raining at 7am when Len picked me up, and I expected that the morning's field trip would be replaced by a classroom session.In fact, Len was even more keen than ever to get out in the bush and take photographs. "You've got your rain gear haven't you", he said, "The light's perfect and the rain just makes the colours glow"We walked a kilometer or so down a bush track by a stream, and proceeded to take a series of interesting shots of moving water with the 4x5", with Len holding an umbrella over the camera and me at the controls.During this time we had extensive discussions on composition, lens selection, focus, depth of field, exposure, camera movements, film selection and many other subjects. Later, back at Len's place, we developed the transparencies - critique with loupe and lightbox completing the day's tuition.Len impressed me with his extensive knowledge and mastery of various photographic techniques.He communicated well and was flexible enough to accommodate any request.I would have no hesitation in recommending Len to anybody wanting to take their photography to the next level, and with the added bonus of the Blue Mountains as the setting, you couldn't really ask for more." "Had a fantastic time doing the Master Class, sitting around a table with other like minded individuals discussing photography and getting critiques was a major step in taking my photography to the next level. Thanks to Len for all his help and support." "I enjoyed the Master Class very much, I learnt a lot, and I met a great group of people who have inspired me to take my photography further........I hope to do more with this group and Len in the future........."
"To all who wish to learn photography at Len's School - Len is a fantastic Mentor, Teacher and a great Friend"
I truly want to thank YOU for such an amazing weekend. You were so generous with your time, your expertise, with sharing your work and what you think makes a good photo great, and particularly generous with yourself. That might sound a bit strange but you gave so much of yourself on the weekend and I so valued that. It's a unique experience to be able to feel the energy and the passion that drive a creative talent - and you shared that with us too. Thank you!! I need a bit of time to think about all that I learned on the weekend (things are a bit crazy for me at the moment) but I feel very sure that I'd really like to work with you again. Many people are great photographers - but you are also a particularly effective teacher as well - and that's rare!! I'd really like to continue in some way to work with you but I'll be in contact about that once I've thought a few things through. I'm so glad to read that you enjoyed the workshop weekend too. It was a great group of people and we were so so so lucky to just have five of us in the workshop. You were also exceptionally generous with what you charged for the weekend. No wonder there are so many containers of film still left in your fridge to be processed!!!!!!! Hope all is well for you and thanks again for a truly inspiring, creative, thoughtfully-presented and beautifully-paced learning opportunity on the weekend. I loved every minute!!!! "I just wanted to thank you for a great weekend. The scenery, the food, the photography help,the learning opportunities and the organisation were all excellent. Thanks again." 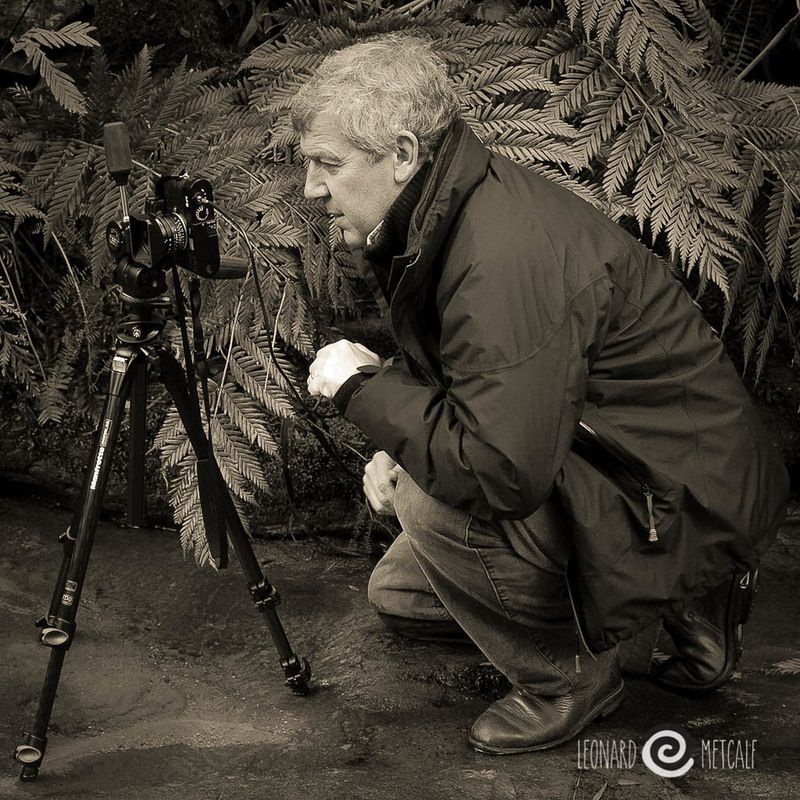 "Leonard critiqued my work and was able to give me some very useful tips and ideas regarding the artistic quality of my images which has lead me to grow as a photographic artist. He was able to describe and demonstrate the subtleties of matting, framing and presenting the final image. His knowledge of art photography is very well rounded and because of his encouragement and expertise I was able to organise my first exhibition at the Breewood Gallery in March 2008." This email is to thank you for the professional care and expertise you demonstrated as facilitator at the recent teacher workshops: Professional Conversations for CGVE/Equity staff. Everyone who participated in these workshops found the information most relevant and useful for their teaching. Furthermore, the workshops allowed us to have the opportunity to effectively reflect on teaching practice. Unfortunately, this process is often cast aside due to time constraints. Finally, the teachers and youth workers who participated in the workshops have started the new term with fresh ideas, good networking principles and the knowledge that they are “on track” with their teaching programs. Many thanks Len. (Len is) “enthusiastic, happy, friendly, willing, dedicated, knowledgeable and genuine. He has good vocal control, is aware of timing, has a good style of presentation and lots of practical experience. Just a note to say how much I enjoyed your facilitation of the Staff Development yesterday. The initiative games you deliver and the follow up of the experience always leave me with some insight into the work we do. I have spent some time since yesterday, actually at 3am when I woke up going wow, about the way the group, (Team) came up with what was written on the whiteboard and how the whole section operates within those thoughts. I know I push the boundaries and sometimes haven’t appreciated the way the whole team looks at our work so incredibly thorough. Thank you so much for your wonderful support in assisting us in making the recently held ISER Behaviour Conference at Batemans Bay a wonderful success this year. Your presence and contribution was greatly appreciated.